This is a novel of love, loss, betrayal and rejection. There is a commendable mix of wit and heartbreaking, emotional circumstances. Susie, the main character and mother harbours a big secret for fifty years which silently poisons the happiness of all her family. The secret grows like a cancer because she can't cope with the guilt and shame. Finally the family are faced with the final challenge. It was set in 1968 onwards and a nostalgic trip for me with the references to music like, "What becomes of the broken hearted" which remains a favourite of mine and the 11+ (not a good memory) and the mention of the Janet and John books with stories about a middle-class nuclear family and the reference to the Family Circle magazine. The characters were superbly painted and I enjoyed the sibling rivalry between Louise and Grace. They were like chalk and cheese. It requires a lot of empathy to read it without being judgemental and inevitably you think - what would I have done? Thank you to NetGalley and Bookouture. 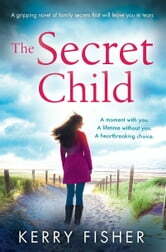 The Secret Child is a powerful and emotionally charged character-driven novel. The story is heartbreaking and well as touching. I didn’t want to put the book down, for even a moment. And, this superbly written story stayed with me, long after I turned the last page. Susie counted herself lucky to be married to Danny, even though as a military man, he was gone for long stretches of time. When Danny was home, though, he was a kind, loving and devoted husband. And, that was exactly why Susie couldn’t confess her infidelity to him. To make matters worse and add to her list of sins, Susie had given her son away. So every time Susie witnessed Danny with their grandson or her friend Jeanie’s son, her gut would wrench. And each time her insides twisted with guilt, Susie withdrew more into herself. The carefree, beautiful wife Danny had left with their daughter before deploying overseas, was not the same women he came back to. Susie had become moody, withdrawn and depressed and Danny had no idea why. He tried everything he could think of to make Susie happy, without success. Danny even left the Navy and took a factory job, which he despised, just to be home more. But, Susie’s guilt over giving away her son and now losing her daughter’s affection, was tearing her up inside and stealing the very life out of her. It would be Susie’s estranged daughter, of all people, who would be the one to step-up, comfort her mother, and help her to heal. The Secret Child is an unforgettable, moving novel. The characters are well-developed and alive. I felt their pain, their brokenness, their trials and their forgiveness. Truly a beautiful story, so well-written that even days later, I was still thinking about it. This is an outstanding novel and one that I will read again and again. Kerry Fisher is fast becoming a favorite author of mine. I will definitely be reading her next book. Thank you, Bookouture and NetGalley, for my advanced review copy. I absolutely loved it! In 1963 Susie was forced to give up her newborn baby son for adoption. She wasn’t some silly teenager pregnant with her first child, Susie was a happily married mother to one daughter, Louise. Susie had decided to go through the heart wrenching decision as the baby wasn’t her husband Danny’s child. Her mother convinced her that her marriage would be over if Danny returned home from his tour of duty, after being away for fifteen months, and found her with another man’s child. As the years passed by Susie was desperate for another child, but month after month, year after year, she failed to become pregnant. Then in 1977 a miracle happened, and her second daughter Grace was born, but even a second daughter couldn’t take away her guilt and regret. For 45 years Susie lived with her heartbreaking decision the best she could, but in doing so she had become distant from her husband, and an overbearing, pushy mother to her daughters. The Secret Child is one hell of a roller-coaster emotionally wise. The book opens in 2013 with Susie talking about what happened to her in 1968, from her time staying with her aunt after she was sent away so people wouldn’t know she was pregnant, to the birth of her child. Don’t be so quick to judge though until you have read her full story. The book then goes back in time to July 1968 whilst Susie still had her son, just a day away from giving him up for adoption. Each chapter is a different period in time, as the book moves from one month to the next and sometimes jumping years. You get to feel how much pain Susie felt and how it impacted on her life and those close to her, especially her daughters who she was desperate to save from repeating her mistakes. It was heartbreaking at times to read, but I needed to know Susie’s story. I felt like I was sitting with an elderly relative whilst they were telling me about their life, a life that they never fully lived. The book is split into two parts, the second from her youngest daughter Grace’s point of view and how as a young woman she resents her mother’s strictness. I love how Ms. Fisher told us Susie’s story and how much her decision in 1968 affected her for the rest of her life, then in the second part how we get to see how the way she brought up her children, whilst living with that guilt affected their lives too. This is a poignant story that I’m positive truly represents how a lot of women who back in the day were forced to give up their babies for adoption feel every day. I can’t imagine being without my three boys, so it’s hard to comprehend how it must feel to live every day knowing that you have a child somewhere out in the world, wondering what their first word was, what school they went to, what qualifications they got. Ms. Fisher has a beautiful way with words that resonated deep inside me. I can see Susie’s story staying with me for a long time to come.